For a great web presence and sure-shot success in catching the attention of potential customers, a website needs to outshine on parameters of usability, navigability, convenience, and compatibility. With custom web development, you get a fully-functional website tailored to meet your business needs. WeblinkIndia excels amongst custom web design and development companies in India and offers best custom website development services. 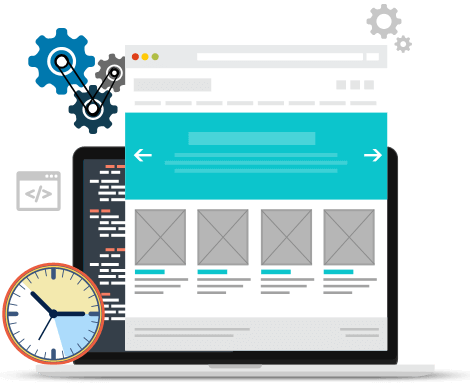 Our rich experience in front-end custom development, including elements like image carousels, slide-out menus, etc., help in customizing the website fully in accordance to client’s business preferences. Custom Web Development gives you an advantage to be distinct from your competitors. It will be very common if you use a template based website without customization as millions of others might be using the same generic template that looks just like yours. In an open source package, you are required to pay for different features that you may not even require. But, this is not the case with custom website development as here you will be paying just for the functionalities that you actually want. With Custom Web Development, you have the advantage of opting for the technologies that you want your website to be developed on. This helps to scale your business and streamline it for future business requirements. With the services of a custom website development company, you get a customized website to easily make modifications according to the varying requirements of the business. With our custom website development services, you get the scope of being creative with your design. This gives an option of incorporating distinct features that give you a competitive advantage over your rivals. The initial cost of designing and developing a customized website may be higher than that of pre-built websites but down the road you require less spending. In the light of guaranteed better ROI, a custom website design is worth the expense. Tow Truck Sydney Ventures – with industry knowledge and experience- is involved in rendering a variety of services under one roof. We provide services for car unlocking, fuel supply, tyre change, caravan & boat towing, motorbike towing, removing unwanted cars, and machine towing. Ours is a group of experienced professionals, who work together to complete the assigned task with care. We are available round the clock and charge reasonably for our services. We provide special discounts on advanced bookings. To know them, browse our website that is designed by WeblinkIndia.Net Pvt. Ltd.
Allday Medicine is a Singapore based company that is engaged in providing a large array of authentic prescription medicines. We are widely appreciated by the customers as we provide the most affordable generic medications online. A wide range of medicines are provided by us like pain relief medicines, digestive system medicines, antibiotic medicines, asthma medicines, women health medicines, and many more. The website of Allday Medicine has been developed, designed, and managed by an E-commerce web development organization based in New Delhi, India, namely WeblinkIndia.Net. 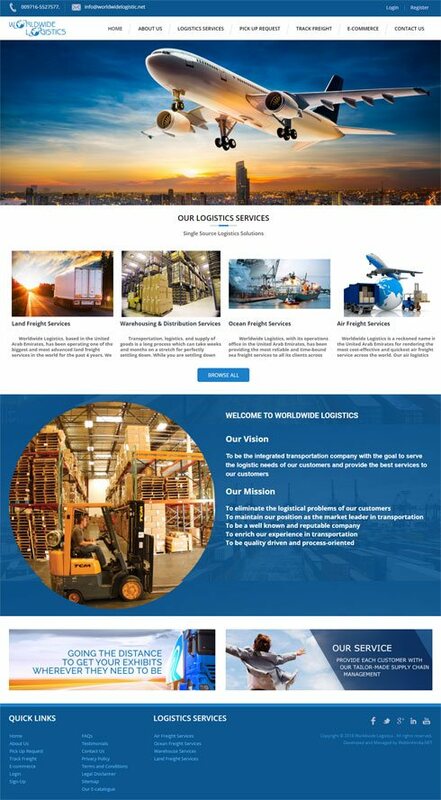 Worldwide Logistics is a renowned name that is enlisted amongst the leading service providers of logistics. Our logistics services include air freight services, ocean freight services, warehouse services, and land freight services. With us, you can also place a pick up request, track the freight, and avail e-commerce solutions. The company is operating from its headquarters that are located in the United Arab Emirates. Our website is designed, developed, and managed by a Delhi (India)-based organization named, WeblinkIndia.Net Pvt. 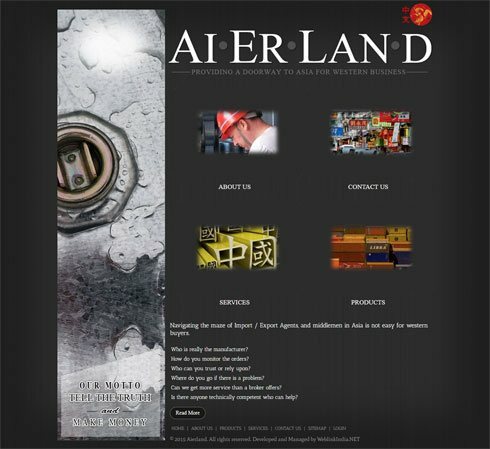 Ltd.
Aierland is Hong Kong based firm founded by John O’Mahony. John is in the industry since 1993. An expert Microbiologist, Food Technologist and Biochemist, he has lectured in Universities in China and Hong Kong. He has the credit of managing a food company in Ireland for good number of years. He also worked in set-ups such as QC, QA and R&D. Not just this, John has worked as an ISO lead assessor and audited factories in China for prominent names like M&S and Northern Foods. WeblinkIndia.Net, expert in Dynamic Web Designing, PHP Web Development and Web Hosting, has designed the aierland company website. Why Choose WeblinkIndia For Custom Web Development? With the help of our custom website design and development services, your business will have a store that is open for 24 hours a day, 7 days a week, and 365 days a year. With the services of this custom web development company, you get a website that instills an element of uniqueness to your brand and differentiates it from your competitors. In a way, the websites customized by our custom website developers showcase design customizations in overall theme, layout, navigation, etc., reflects and maintains a consistent brand identity for your company. Our custom website developers in India prepare website designs with an awareness of the target market and its exact requirements for visiting the site. By customizing the feel & functionality of the website, our developers ensure that more and more visitors from the targeted section stay on the page. All E-commerce websites that the developers at this custom website development company generate are connected with Google Analytics, which not only lets you track the number of visitors to your page, but also tells you from where they have come, and how many of them are converting. Our custom e-commerce development services help you in setting stores easily to provide upsells. For instance, higher version of a product can be automatically shown to the customers, this will eventually lead to an upsurge in the sale value of every order. What People Are Saying About WeblinkIndia's Custom Development? begin with understanding all the exclusive needs of our clients, and for that we fabricate a questionnaire that helps our experts in understanding the clients and their requirements. This gives us a chance to frame an idea, and formulate an effective strategy to build mock-ups for your website. process includes creating custom graphics, database integration, making scripts as per the needs of the project, and adding surplus functionalities required by the client, etc. integrate each and every idea and create a plan for the website. At this position, a number of analyses, modifications and reviews from clients are gathered to acquire the final understanding of the needed wireframe. Once the website is created and uploaded on our servers, we ask the clients to have a look and inform us if they seek some sort of modifications in any segment. Also, at this stage, the bugs are recognized and removed. Once the final testing is done, the files are given to the clients as per their chosen delivery format. As you learn and get used to managing your website, we stay along with our excellent ongoing support through Email, phone, chat, & keep you updated with the new features that could be integrated to enhance the look, feel, and functionality of your website.